What was once a promotional cigar reserved only for in-store events is now part of the regular portfolio. Made by Rocky Patel in Nicaragua, the Tabaquero by Hamlet Paredes Culebra can be purchased at retail. The Culebra is a trio of three thin cigars twisted together in a braid. 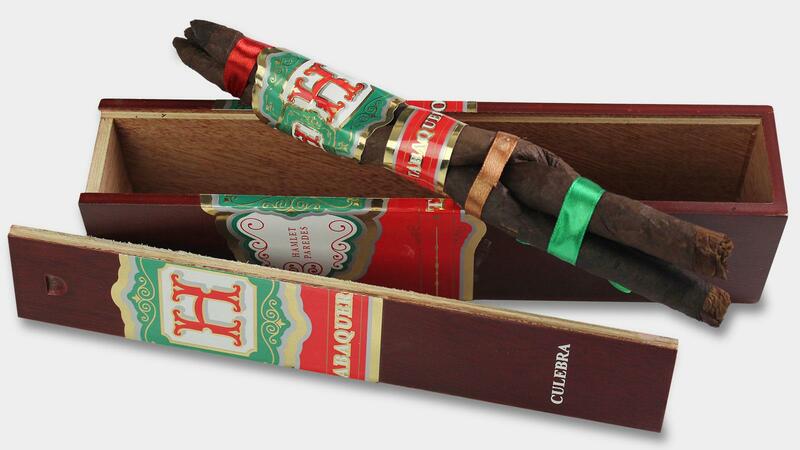 In this case, each cigar in the Culebra offering measures 8 inches, considerably longer than traditional culebras. Every box of three will retail for $36 and the cigars are not intended to be sold individually. The blend consists of a Mexican wrapper, Brazilian and Mexican binders and Nicaraguan filler. The addition of this long Culebra brings the brand to seven sizes. Hamlet Paredes is a former Habanos S.A. cigar roller and ambassador who left Cuba to sign on with Rocky Patel Premium Cigars. The Tabaquero Hamlet Paredes brand came out in 2015 and represents the first time that Paredes ever worked with nonCuban tobacco. A version of this article first appeared in the January 9, 2018 issue of Cigar Insider.